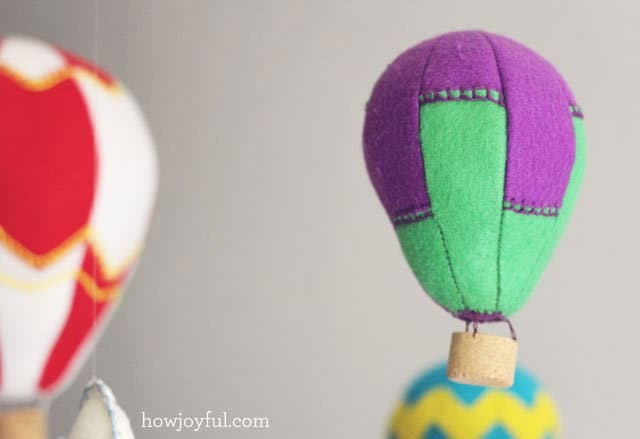 I have been completely obsessed with all things hot air balloons lately and not just any – vintage hot air balloons to be exact. There is something so whimsical and dreamy about them. 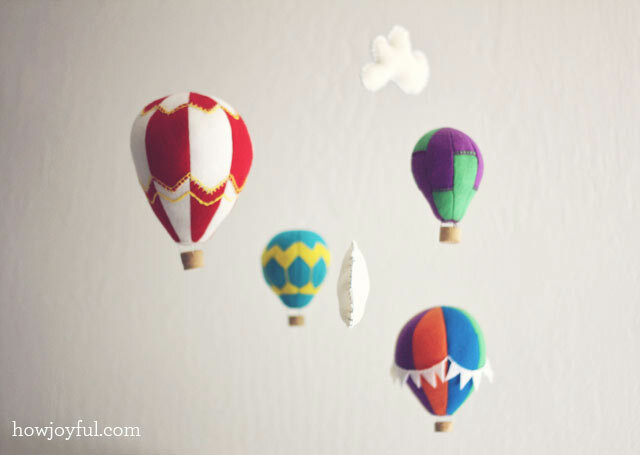 Joy from How Joyful took her love for them and turned them into a nursery mobile for her new little one. Is it weird that I kind of want one over my bed too? While you’re collecting felt to make these beauties, pick up a little extra to make her felt roses and before the heat escapes us, treat yourself to this upcycled summer vest. 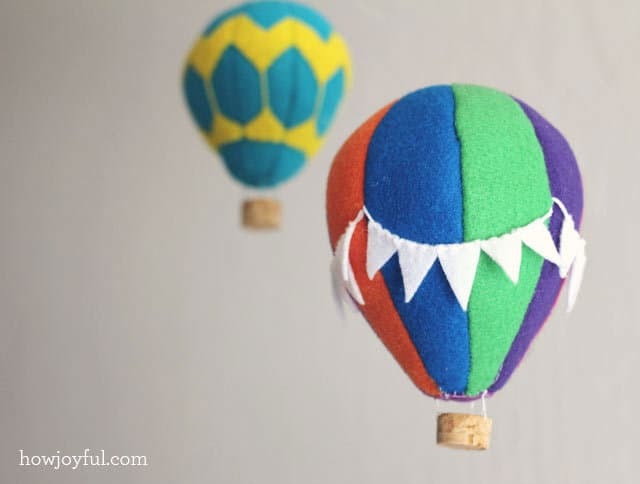 My husband and I are very excited to welcome our first baby in a few more weeks and we have been working hard on getting the nursery ready, one of my favorite pieces is this Hot air ballon mobile. 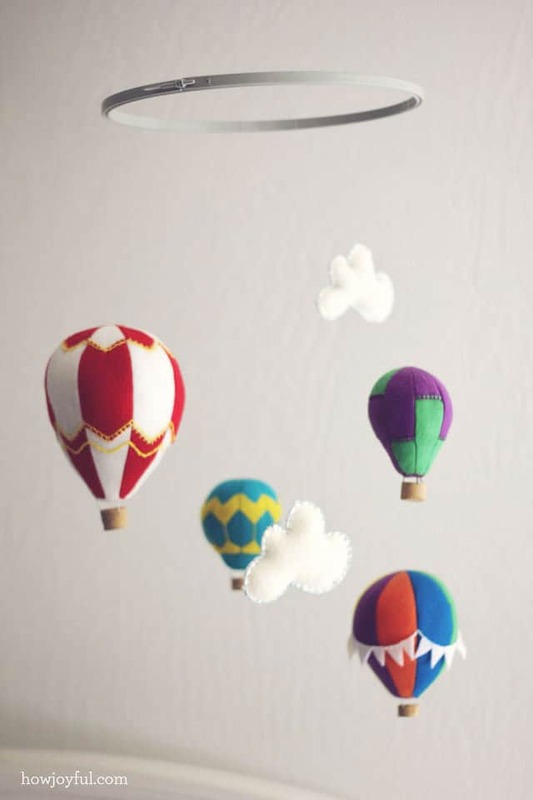 And of course I had to share a template and basic assembly directions so that everyone that loves hot air balloons can create their own designs =] So here the PDF file with the 3 different sizes I used to create mine and the instructions. 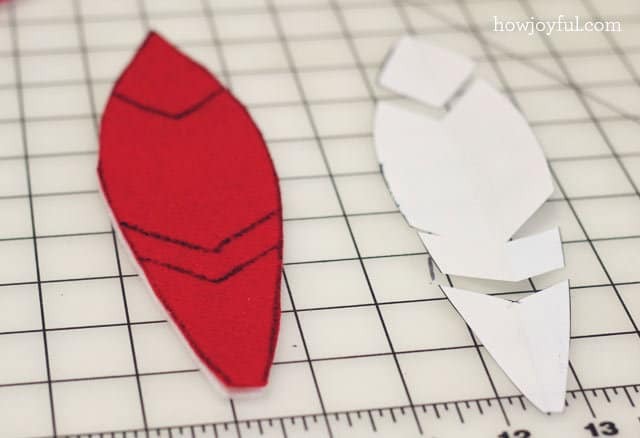 Cut 8 balloon body pieces in the same color, after that I free-cut arrow shapes and triangles direcly on felt, but if you don’t feel comfortable draw your design on the template and then cut, I played with the positioning until I was happy, then turn the pieces with the right side facing up and pin carefully. 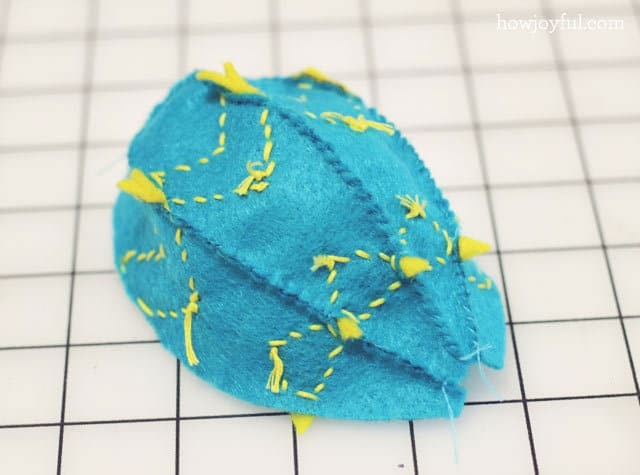 I decided I wanted to make this balloon entirely by hand, so I started sewing each completed piece with a normal needle and treat in matching color. I sewed everything on the wrong side so the sewing stitches will be hidden. I left one of the sides half open so that turning inside out would be easier, then I finish sewing the side and stuff it with Polyester fiberfill. After that I carefully sewed the bottom piece, if it’s too hard for you to keep it in place pin it first. First I decided how I wanted to cut my pieces and draw on the template to the cut it, marked all of my pieces, but right before cutting I decided to only do 2 cuts per piece and eliminate the last mark you see in the picture. 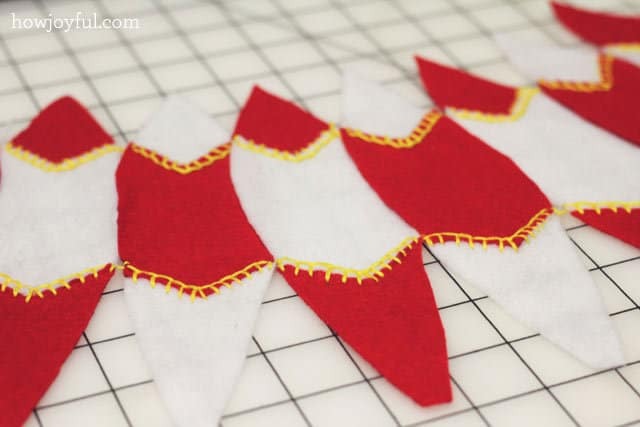 Once all my pieces were cut, I mixed and matches the colors, place a super small pieces of masking tape on the back so that they will stay together edge to edge and sew them with yellow floss. 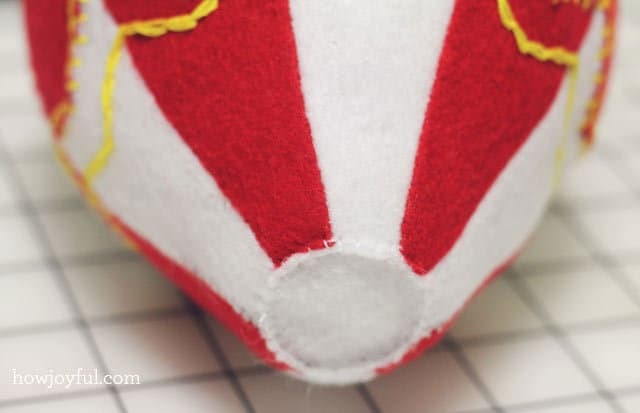 After I had my 8 pieces put together I sewed them in the machine wrong side facing up, so that the stitches would be in the inside. Again I left the last one half open so that the turning inside out would be easier. 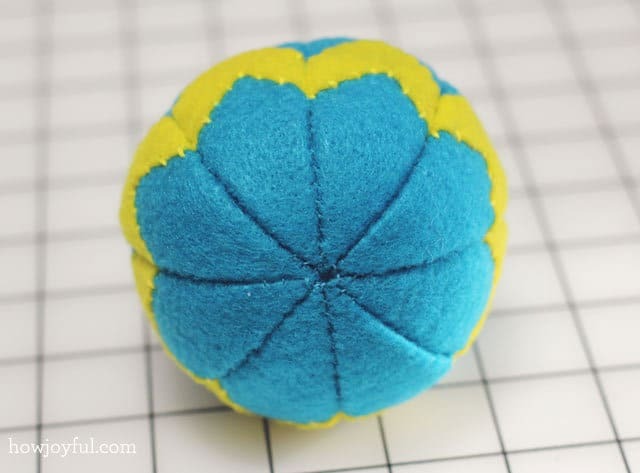 Then I sewed it by hand and stuffed it. Lastly I sewed the bottom piece, and my hot air balloon was done!! After they are done, I cut pieces of corks, I just cut the average wine cork in 3 for all of the balloons, exempt the big one, for that one I used a champagne cork that I cut in half. After that I sanded the outside to erase the letters that most of them had. I used a normal treat and needle to attach the cork to the ballons in 3 different different points. I hope you guys enjoy it and let me know if you make it, I’d love to see the designs you are going to come up with! These are the cutest!!! 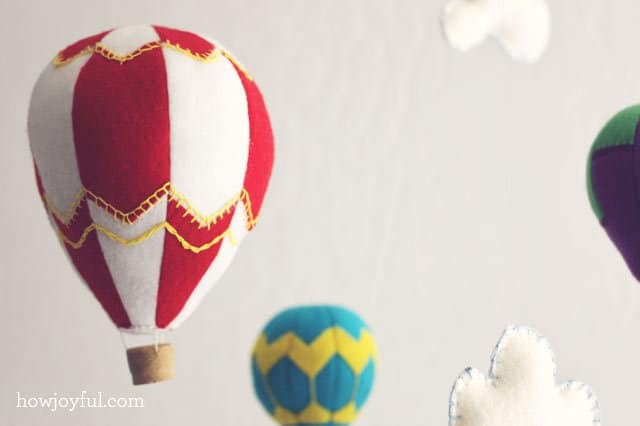 I’m totally obsessed with vintage hot air balloons! We don’t have a baby baby anymore, but I’ll still be making some to put somewhere. I will find a space! Oh and Modest Mouse, of course. I was just listening to that record the other day. 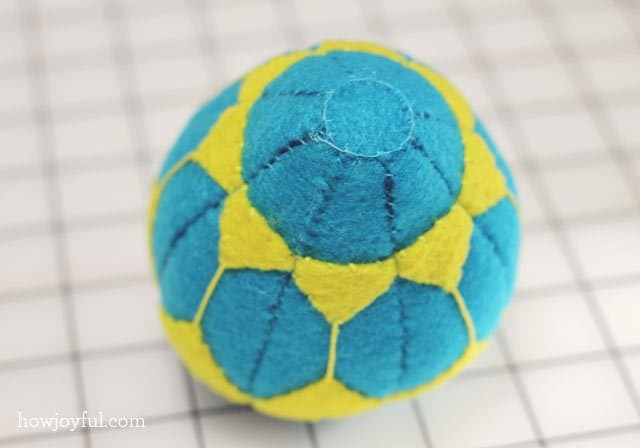 Thanks for the tutorial and great pattern! I’ve just finished mine. 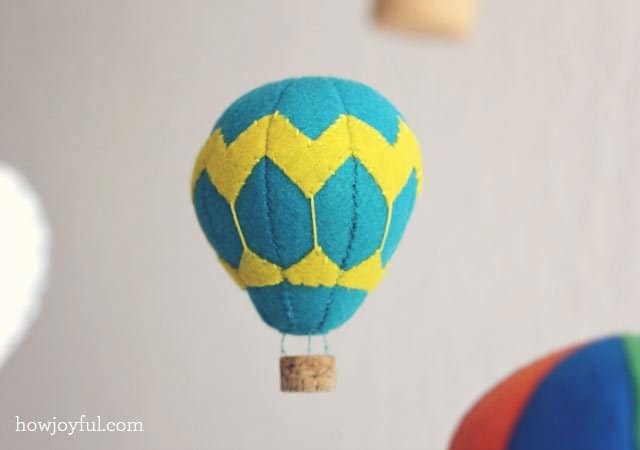 In stead of using a cork, you could also make the basket out of felt. 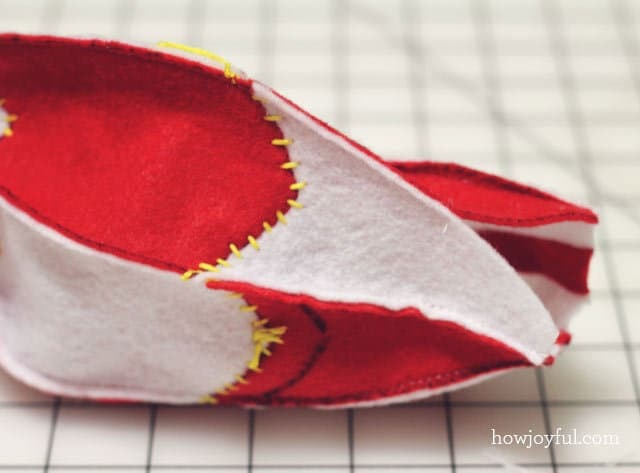 Cut a square, make some small cuts (on each side) and stich the sides together (like the paper baskets). Thanks again! Thanks for this fantastic tutorial. 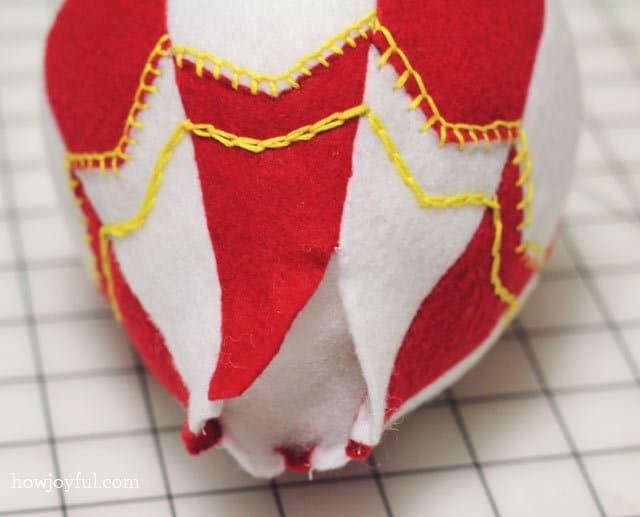 I hand sewed four balloons using your pattern and a few clouds, but have run into a practical barrier. I have the embroidery hoop, but am wondering how you hung the whole completed mobile. Did you attach it to the ceiling? Or, did you create some kind of arm to attach it to the crib? This was my first DIY project in a long time and I want my baby to enjoy it when she’s born! on the web. I am going to recommend this blog! I love these! Made these for a birthday party! Thanks for Sharing!